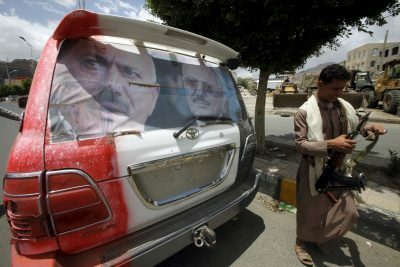 Rival sides in Yemen’s year-long conflict began a tentative truce overnight on Sunday saying they were committed to the halt in hostilities despite pockets of deadly fighting in the hours leading up to it. The conflict between the Yemeni government, backed by Saudi Arabia, and its Houthi rebel enemies has killed more than 6,200 people and triggered a humanitarian crisis in one of the Arab world’s poorest countries. “But if there is any violation of this ceasefire, we will have the right to retaliate, to assess the situation at that time and take whatever steps are necessary to stop these violations,” Brigadier-General Ahmed al-Asiri said by telephone. “This truce is in its early stages, violations may occur in the beginning, but we hope the next few hours will see more discipline towards the ceasefire,” Yemen’s foreign minister Abdel Malek al-Mekhlafi told the channel from Riyadh. Hours before the fighting was due to stop, heavy battles flared between forces loyal to President Abd-Rabbu Mansour Hadi and Houthi fighters in al-Maton, north of Sanaa, residents said. In the central Bayda province, battles in the al-Sawadiya and al-Zaher districts killed more than 20 people on Sunday, local officials and residents said, and fighting continued in Taiz. “I am tired of the fighting, the destruction, everything,” said Hussein Ali, a 57-year-old government employee.